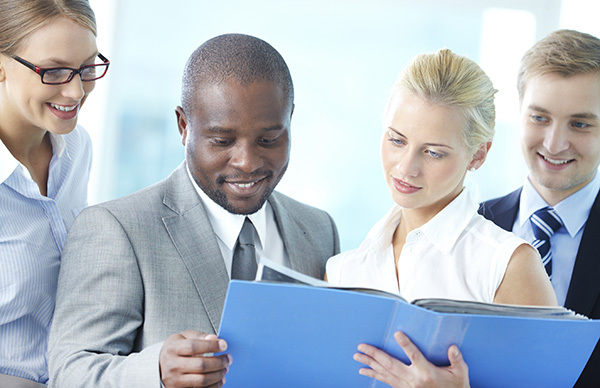 Despite large overall discrepancies in company and budget size, mid-sized organisations operate similarly to its counterparts at the enterprise level. A recent Aberdeen report explores the implementation of business intelligence (BI) within mid-market organisations and uncovers some reasons why this environment might be suited for analytical activity. Although bound to an overarching corporate strategy, large enterprises operate as a collection of smaller ones, each being responsible for its people and decisions. The growing urgency for analytics stems from this very phenomenon. 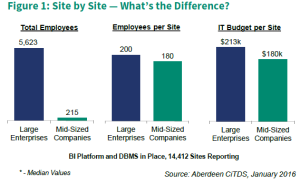 Aberdeen’s Ci Technology Data Set (CiTDS) reveals that for organisation’s deploying both a BI platform as well as formal database technology, the sites responsible for implementing and managing those technologies look very similar, regardless of the company size. 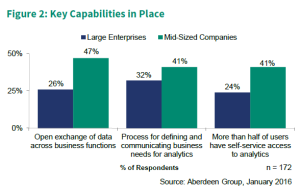 Aberdeen’s research consistently demonstrates how certain organisational capabilities can enhance a company’s success with analytics, and mid-sized companies are more likely to have several of these capabilities (see Figure 2). Unlike large companies where there is often red tape, mid-sized companies are able to gain insights into its users’ analytical needs and deliver wherever possible. These companies are therefore more likely to report that a considerable portion of its analytical users have self-service access to the tools needed, without relying on IT. This enables mid-sized companies to achieve more tangible success in its use of analytics (see Figure 3). 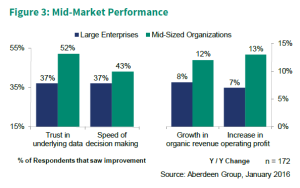 Start by focusing on the data – Best-in-Class companies in the mid-market are more likely to think strategically about its data environment by identifying the important data sources, ensuring quality and viability, and improving accessibility across the company. Build the analytical mindset, don’t be overwhelmed by technology – Aberdeen’s research shows a link between engagement in analytical activity and improved business performance. Best-in-Class companies are twice as likely to report a culture of curiosity that values data-driven decisions and promotes exploration of business data. When expanding analytics, fill the need…and the want – Earlier Aberdeen research on the total cost of ownership (TCO) of BI shows how adopting analytics leads to a lower TCO and a higher return on investment (ROI).